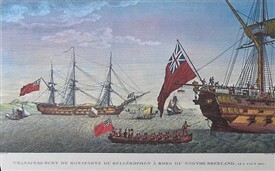 A 1815 timber ship. Prisoners transported in hold. An oath-bound society known as Trashers was active in the south Mayo area in the early decades of the 19th century. Thrasher societies were composed of poor Catholics and were mainly active against landlords’ agents but they also took action against anyone with whom the general community had a grievance. Thrashers wore white handkerchiefs round their necks to identify themselves where necessary. 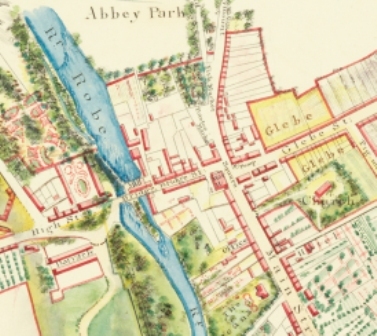 Brothers Peter, Patrick, James and Denis McHugh and Patrick Hopkins together with three or four other young men armed with guns, bayonets, pistols and sticks called on the house of Peter Canna of Ballinrobe on the night of 11th March 1811 when the family were in bed. The intruders, who disguised their voices, demanded firearms and enquired if the Cannas’ neighbour Mr. Fair had a gun in his house. Canna’s son Anthony was dragged out of bed and given a severe beating. There were shouts of “Shoot him, Murty” but Patrick Hopkins pulled Anthony out of the way and he managed to hide. The forename Murty was spoken several times by the attackers. The gang made Peter Canna swear that he did not know any of them. “I believe, boys, it was with intent of murder you came here” said Peter Canna and two thrusts of a bayonet were then made at him but he avoided being wounded. The gang briefly went next door but returned a few minutes later just as Peter finished putting on his shoes. They again demanded that he hand over his firearms. Peter successfully defended himself at the door with a pitchfork. Despite the fact that the attackers fired fourteen shots, he wasn’t hit. His wife was less fortunate. She was in bed protecting her daughter whom, according to Peter, the gang wanted to take out and abuse. Two shots struck Mrs. Canna and she died instantly. The daughter was also dangerously wounded. At their trial Peter McHugh was the only one to plead guilty. He confessed that he fired the shots that killed Mrs. Canna. He was persuaded to confess by three priests who attended them after they were arrested. Two of the McHugh brothers claimed to have alibis but they were not believed by the jury. Anthony Canna said he knew Patrick Hopkins from infancy and he knew the McHughs for two or three years. He said Hopkins saved his life. 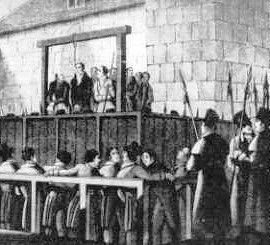 The four McHughs brothers were found guilty and sentenced to be hanged. 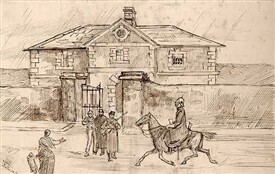 A large crowd assembled on Saturday 30th March 1811 beside the Bridewell [Jail] in Ballinrobe in what was later known as ‘Flannery’s yard’ to witness the public execution of the four McHugh brothers. Their mother whispered to the first two “upon no account acknowledge anything” before they were turned off the scaffold. Peter, the oldest of the brothers, was the last to be hanged. 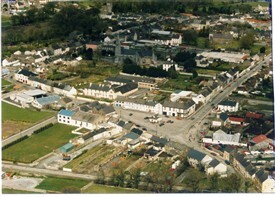 Their bodies were brought to Castlebar the next day and were buried in the jail yard on Monday as the CountyHospital did not require any bodies for dissection at the time. The life of Patrick Hopkins was spared but he was transported for life. He arrived at Sydney in 1813 on the convict ship Archduke Charles after a two hundred and seven day voyage via Rio de Janeiro. He was 5ft, 5½ in height, of ruddy complexion with brown hair going bald. In 1823 he was put in charge of Cornelius O’Brien’s grazing run east of Lake George. 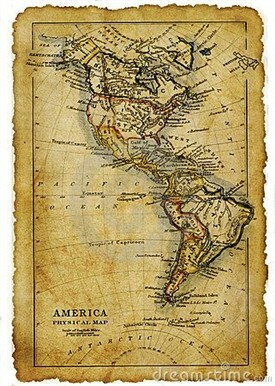 Cornelius O’Brien (1796 – 1869), was a native of Hollymount, Co. Mayo and a very substantial farmer in New South Wales. In May 1835, together with Andrew Loftus, Hopkins purchased one hundred acres of land in FostersValley near Bathurst. Among those who witnessed the executions was James Caulfield who was then a young man working in Creagh. James lived to over a hundred years and died in Turloughmore, The Neale. This page was added by Averil Staunton on 19/01/2018.